The HI-SEAS Crew 2 had a live Google Hangout event today when they returned to “Earth” from “Simulated Mars”. They have been living in a Mars simulation located on Mauna Loa for the past 120 days. Mars Mission on the Big Island Delayed 24 Hours – What Would You Cook on Mars? The Hawaii Space Exploration Analog and Simulation (HI-SEAS) project was scheduled to begin today on the Big Island. It will begin tomorrow following a small delay. The HI-SEAS crew spent the last week at the Ka’ohe Restoration Area helping with reforestation efforts on Mauna Kea. This was part of the crews week long pre-mission cultural experience. 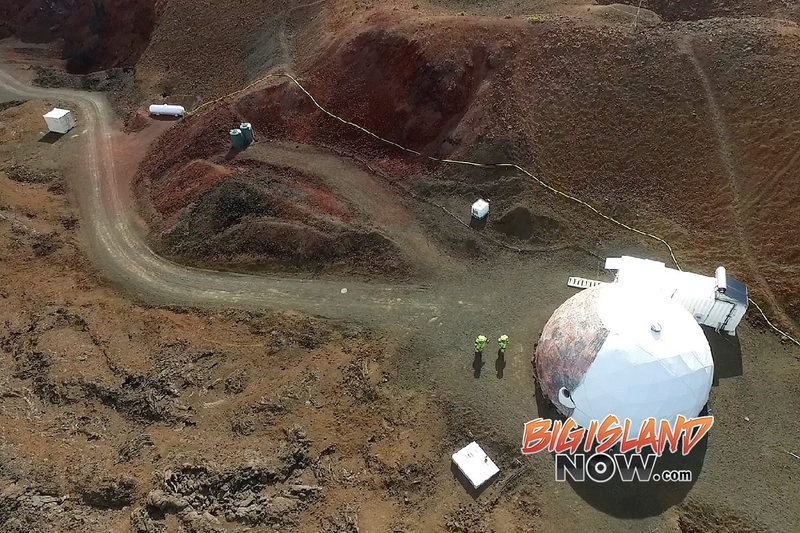 The HI-SEAS Project is a project that NASA has developed to figure out how to cook food on the Planet Mars, in a Mars like environment here on the Big Island. You can follow them on Twitter at #HISEAS or follow their website: Hawaii Space Exploration Analog and Simulation. The NASA Human Exploration & Operations Mission Directorate has identified a number of risks associated with long-term human space exploration. Many of these can be fruitfully investigated in an Earth-bound analog environment – that is, somewhere on Earth that is similar to the target space environment in relevant ways. 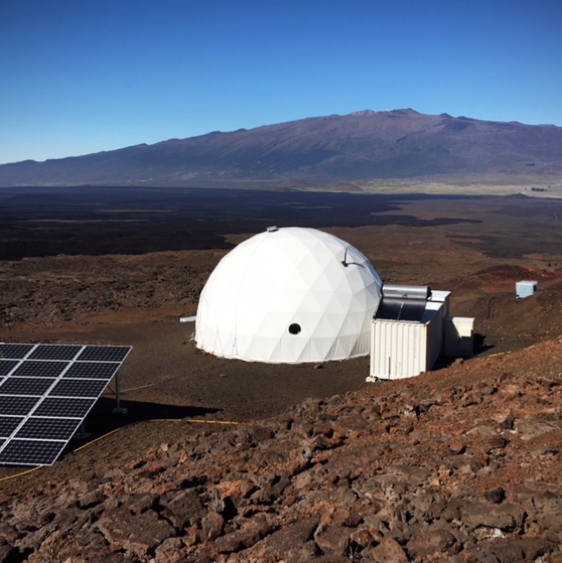 HI-SEAS (Hawaii Space Exploration Analog and Simulation) is a planetary surface exploration analog site at ~ 8500 feet on the Mauna Loa side of the saddle area on the Big Island of Hawaii. Six folks were selected for the Mars HI-SEAS Project that will be taking place soon on the Big Island of Hawaii. Dr. Oleg Abramov was born January 1978 in St. Petersburg, Russia, and grew up in Brooklyn, NY. He earned a bachelor’s degree in Biology from Clarkson University (1998) and a doctorate in Planetary Sciences Planetary Sciences, with a minor in Molecular and Cell Biology, from the University of Arizona (2006). After earning his Ph.D., Dr. Abramov held a Postdoctoral Researcher position at the Southwest Research Institute in Boulder, CO in 2006-2007, was a NASA Postdoctoral Fellow at the University of Colorado from 2007 to 2010, and a Urey Fellow at the Lunar and Planetary Institute in Houston, TX, in 2010-2011. Dr. Abramov is currently a Research Space Scientist at the U.S. Geological Survey Astrogeology branch in Flagstaff, AZ. He is conducting several research programs, including laboratory studies of lunar zircons, field investigations of ancient terrains on Earth, thermal modeling of impact craters, and studies of Enceladus and Europa using analysis of data from the Cassini and Galileo missions. Dr. Abramov performs frequent field work at remote locations that included arctic Canada and the Australian outback, is a certified Wilderness First Responder, and has previous experience in a simulated Mars habitat (Mars Desert Research Station). He is an instrument-rated private pilot and enjoys skydiving, SCUBA diving, rock climbing, distance running, backpacking, skiing, and whitewater kayaking. Dr. Yvonne Cagle (Reserve Crew) is a NASA Astronaut and Family Physician. In 2008, Dr. Cagle retired as a Colonel in the USAF where she served as a Senior Flight Surgeon prior to her selection to the NASA Astronaut Corp in 1996. In 2005, Dr. Cagle was assigned to the NASA/ARC as the lead ARC Astronaut Science Liaison and Strategic Relationships Manager for Google and other Silicon Valley Programmatic Partnerships. Dr. Cagle’s groundbreaking work is preserving historic NASA space legacy data while, simultaneously, galvanizing NASA’s lead in global mapping, sustainable energies, green initiatives, and disaster preparedness. Dr. Cagle is advisor for the Commercial Reusable Suborbital Research Program (CRuSR). Currently Dr. Cagle is on faculty and serves as the NASA liaison for exploration and space development with Singularity University. During the workshop, Dr. Cagle was embedded with the crew as a crew training consultant and advisor, providing insights and feedback to both crew and study team from the viewpoint of an astronaut, flight surgeon, space development expert and science liaison. Simon Engler obtained his BSc in Astrophysics & Mathematics in 2001 from St. Mary’s University. He then worked and studied as a scientific programmer at the University of Amsterdam in the Center for Computational Sciences until 2003. Upon his return to Canada, he worked on various software development projects. In 2006 Simon joined the Canadian Armed Forces and served with 1 Combat Engineer Regiment for five years. He served a ten month combat tour in 2009 where in addition to his regular duties he built and tested a robotic platform. The robotic platform is now on display at the Military Museum in Calgary. He then enrolled a MSc robotics program at the Schulich School of Engineering at the University of Calgary. Currently, Simon is on an internship at the Robotics Institute at Carnegie Mellon University. He is helping with Zoe, the first Astrobiological robot prototype being designed for a mission on Mars. Simon is an avid hiker, and can be found on hiking trails in the rocky mountains in the summer. Simon also continues his studies in space sciences and conducts spectroscopic research on binary star systems at the Rotheney Astrophysical Observatory. Kate Greene is a science and technology journalist and native Kansan. She has a B.S. in chemistry and an M.S. in physics, with a focus on mid-infrared lasers and LEDs. As a journalist, she’s written for Discover, The Economist, U.S. News & World Report, and Technology Review, among others. She covers topics ranging from human-computer interatctions and data mining to human factors in space flight and open-heart surgery. Kate speaks at technology conferences and was a visiting lecturer at Vanderbilt University in 2011. An amateur filmmaker, she has produced films for San Francisco’s 48-hour Film Festivals. In 2008, she presented a prototype for a fiberoptic light pipe at the Bay Area Maker Faire. Kate is an avid open-water swimmer who won ultraswimmer Jamie Patrick’s adventure swim contest in 2011, by designing a cross-country swim from Nashville to San Francisco, completed in June of 2012. The chronicle of her swims and travel can be found at riversandroadsjournal.tumblr.com. Crystal Spring Haney (Reserve Crew) is a small business owner, personal trainer and at-home mother of two who lives with her husband, Mark, a U. S. Navy Surface Warfare Officer, on their Shannon 50 in Ko Olina, Kapolei, Hawaii. After obtaining a BS in Computer Science, BA in French and BA in German, with honors, from The Citadel in 2001, Crystal attended flight school with the U. S. Navy in Pensacola, FL where she was selected to fly SH-60B Seahawk helicopters in San Diego, CA. Crystal completed a tour as the Training and Readiness Department Head for Commander, Helicopter Maritime Strike Wing Pacific following two deployments with the HSL-45 Wolfpack. She chose to leave the service in 2009, deciding to stay home with her first child. Crystal started a business from home in 2011 providing consulting servives to the Fitness/Wellness and Maritime communities, quickly expanding into Web Design and Marketing. She is an active amateur bodybuilder and triathlete, National Federation of Professional Trainers Certified Master Trainer, American College of Sports Medicine Professional Member, Lifetime U. S. Parachute Association Member and U.S.A. Triathlon member. Her business, Spring Haney, Inc. is a Wyoming Corporation and member of the Jackson Hole Chamber of Commerce. Chris Lowe (Reserve Crew) is a Space Systems Engineer from the South East of England. He is 27 and lives with his partner, Louise, in Glasgow, Scotland. He began as a PhD candidate in September 2011 at the Advanced Space Concepts Laboratory, University of Strathclyde, where his research is focussed on improving the efficiency of multi-agent, small satellite Space missions by combining Model-based Systems Engineering, Simulation and Multi-Objective Optimisation approaches and applying them across the mission lifecycle. Prior to joining the ASCL, Chris worked as a Design Engineer at Magna Parva Ltd, a company dedicated to the design and analysis of technologies destined for extreme environments. In this role, he worked on various Space Science instruments including the ‘Life Marker Chip’ (ExoMars) and the ‘Mercury Imaging Xray Spectrometer’ (BepiColombo). In addition, he holds both Undergraduate & Masters degrees in Aerospace Engineering from the University of Southampton. In his spare time, Chris enjoys most things that the outdoors has to offer, including Climbing, Sailing, Flying, Cycling and Swimming, with Squash and Bouldering consuming most of his down-time during the week. When the weather permits (this is not all too often in the Scottish Highlands! ), he finds fulfillment in escaping Glasgow’s city lights, setting up a camp and getting stuck into a good book under the night sky. Dr. Sian Proctor is a geology professor at South Mountain Community College in Phoenix, Arizona. Throughout her adult life she has pushed herself to take on new challenges and to learn new things that she can bring back into the classroom. She has a B.S. in environmental science, M.S. in geology, and a Ph.D. in science education. Both her masters and Ph.D. research involved the use of technology and understanding how individuals learn. She is continually developing new ways to engage her students and to present scientific information in interesting ways. She has a strong curriculum development background, has traveled and taught around the world, was a finalist for the 2009 NASA Astronaut Program, and was on the Discovery Channel reality TV show called The Colony. Sian’s experiences on The Colony taught her how to live in a unique environment with limited resources. She believes in life-long learning and tries to instill this mentality with her students. Her project will involve creating an interactive blog through which she will disseminate information about the crews food experiences and the scientific research being conducted. Her goal is for her students and the general population to access and interact with the web site over the four-month mission. Yajaira Sierra-Sastre is a materials scientist and educator with ten years of research experience in academic, federal, and private institutions. Yajaira received her bachelors of science degree in chemistry and teacher’s certification from the University of Puerto Rico-Mayaguez and her doctorate in materials chemistry from Cornell University. After college she returned to her hometown of Arroyo in the southeast coast of Puerto Rico, to teach chemistry at her former high school. After gaining valuable teaching experience, Yajaira was awarded a summer research fellowship at Stanford University where she characterized the interfacial tension and selfassembly properties of block copolymers. There she discovered her passion for nanotechnology and returned home to work at the NASA Research Center for Nanoscale Materials (University of Puerto Rico-Río Piedras), where she characterized nanomaterials for space-based applications. As part of her PhD studies, Yajaira worked at the Center for Integrated Nanotechnologies (Los Alamos National Laboratory) in the synthesis, imaging, and characterization of semiconductor nanowires. After graduation, she worked for two years at a nanotechnology start-up company where she applied biomimicry and surface chemistry principles in the design of nanostructured coatings for clients in the military, environment, renewable energy, medical device/diagnostics, textiles, and wearable electronics sectors. Yajaira is currently a freelance educator, coach, and social entrepreneur working with disadvantaged school districts and communities in Puerto Rico. She also collaborates in a variety of projects with the Cornell Nanoscale Facility and the National Nanotechnology Infrastructure Network. Her work in nanotechnology, educational outreach, and aspirations to become the first Puerto Rican female astronaut has been recently featured in televised and news media. Her interests also include suborbital materials research and technology commercialization in Latin America and Puerto Rico. Besides her work, Yajaira enjoys Latin dance, theater, outdoor activities, and international cuisine. Angelo Vermeulen is a biologist, space researcher, filmmaker, visual artist, community organizer, and author. His original PhD training in ecology, environmental pollution and teratology plays a crucial role in his art. Vermeulen creates art/science installations that are often open, experimental setups that incorporate ecological processes and living organisms. ‘Biomodd’ is Vermeulen’s most well-known and longest running project. It is a worldwide series of crosscultural, ymbiotic installations in which ecology, computing, and social interaction converge. In 2009 he launched ‘Space Ecologies Art and Design (SEAD)’, a platform for artistic research on the architectures and ethics of space colonization. He collaborates with the MELiSSA life support research program of the European Space Agency (ESA), and is also a member of ESA’s Arts & Science Topical Team. In 2011 his space-related work lead him to start a PhD on space habitation at Delft University of Technology. He co-authored the book ‘Baudelaire in Cyberspace: Dialogues on Art, Science and Digital Culture’ with philosopher Antoon Van den Braembussche, and gives talks about his work around the world. He is a Lecturer at Sint-Lucas Visual Arts Ghent in Belgium, a 2010 TED Fellow, and a 2012 Michael Kalil Endowment for Smart Design Fellow at Parsons in New York. His art works have been exhibited in the US, Europe, Southeast Asia and New Zealand. HI-SEAS is funded for its first season of operation by a grant from the NASA Human Research Program, for research focusing on new forms of food and new food preparation strategies for long-term space exploration. This first mission will involve six astronaut-like (in terms of education, experience, and attitude) crewmembers living in the habitat for 120 days under Mars-exploration conditions (e.g. with communication latencies and blackouts, in close quarters, under strict water-use rules etc.). The crew has been selected from over 700 applicants, and the 120-day simulated mission is scheduled to begin in early 2013.